This is one Florida adventure where you can leave the mouse ears at home! At Butlers in the Buff we have put together the best bachelorette party ideas Orlando. We’ll take you on a colourful, sweet, saucy and glamorous romp through all things bachelorette. For further inspiration don’t forget to look us up on Pinterest or visit Instagram for the latest on bachelorette party trends! Spoil your girlfriends with a handsome, scantily clad party butler to serve you brunch at your hotel suite or apartment! Wearing only a bottom revealing apron, collar, cuffs and bowtie, your Butler in the Buff will ensure that your guests don’t lift a finger. 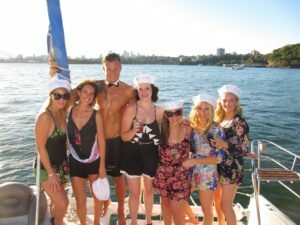 See how you can use our butlers for additional best bachelorette party ideas Orlando.. From mid-morning brunch to an evening cocktail hour, your Butler will be a handsome and helpful addition to any party. He can even assist with your bachelorette party games which you can download for free. If you have ever dreamed of frolicking in vats of chocolate like you’re Willy Wonka then a visit to Farris and Foster’s Chocolate Factory is a must. Create your own unique treats and try delectable combinations of fruits, caramels and nuts. Have one of our Butlers in the Buff surprise your bachelorette party with champagne to enjoy your new chocolates with! The sky is the limit with chocolate themed parties, from chocolate fountain bars, to martinis and other treats from the bar, your fabulous Butler in the Buff will only be too happy to serve up the sweets. Every bachelorette party deserves a gorgeous hotel venue to make their base camp and Orlando’s Grand Bohemian is the perfect spot for a bachelorette weekend away. The surroundings are truly a feast for the eyes and the perfect setting for a luxury weekend getaway with the girls. Enjoy the downtown views and pamper the girls at Poseidon spa. If your group loves creating, getting messy and a really fun out night head down to Drip on International Drive! This interactive performance is one-part Cirque du Soleil, one-part Jackson Pollock painting one-part rock concert. Their highly visual, innovative and messy performances involve coloured sand, raining paint, flying trapeze artists and more! Theme your bachelorette party and have your group wear matching white tops with the bride to be in a white veil and prepare to be splattered! This is an experience worthy of an Orlando bachelorette. If you’re looking for further fun and creative bachelorette party ideas Orlando., visit our blog to get started! Know someone who would make the perfect Butler in the Buff? We are always recruiting across the US and Canada. Ask them to apply online here.